Propanol is a colorless alcohol typically available in two types of isomers: iso-propanol and n-propanol. Isopropanol was one of the first petrochemicals discovered in the ’1960s. Isopropanol, also known as isopropyl alcohol (IPA) or rubbing alcohol, is a colorless, flammable alcohol with a distinct odor. It is used in various applications such as cosmetics, personal care products, deicers, resins, paints, pharmaceuticals, inks, and adhesives, as also as a chemical intermediate to manufacture various chemicals such as methyl isobutyl ketone (MIBK), isopropyl esters, isopropyl amines, acetone, glycerol, and isopropyl acetates. N-propanol is a colorless oxo-alcohol widely used as a solvent in flexographic and other printing ink applications. Growth in the chemicals, agriculture and cosmetics & personal care industry is likely to drive the global propanol market in the next few years. According to Transparency Market Research, the global propanol market, valued at US$2.19 bn in 2016, will exhibit a CAGR of 2.3% from 2017 to 2025 and rise to US$2.68 bn by 2025. In terms of applications, solvent was the dominant segment of the global propanol market, accounting for more than 49% of the global market in 2016. Expected to exhibit a CAGR of 2.3%, the segment of solvents is anticipated to remain the leading application segment for the global propanol market during the forecast period due to steady rise in demand from the global paints and coatings industry. However, it is expected to witness a small reduction in its share in the global market by the end of the forecast period owing to the sluggish growth of key end-use sectors such as printing ink. Propanol is used as an intermediate in the manufacture of various industrial chemicals. It reacts with halogen to produce propyl halide, with ammonia to produce propylamines, and with acetic acid to produce propyl acetate, hence chemical intermediate is another key application segment of propanol market. This segment accounted for the second-leading share in the global propanol market in 2016 and is expected to retain its spot over the forecast period as well. The steady increase in demand from well-established chemical industries in developed and certain emerging economies will help the segment expand at a healthy pace over the forecast period. The propanol market in North America is expected to expand at a significant rate whereas, the propanol market in Europe is projected to expand at a moderate pace during the forecast period. Propanol market in Europe is predicted to be driven by the uplifting chemical industry in the region. Whereas, the propanol market in North America is predicted to be driven by the cosmetics, personal care, and pharmaceuticals industries in the region. In terms of volume, the Asia Pacific market held the dominant share of over 40% of the global propanol market in 2015. The propanol market in the region is anticipated to expand notably in the next few years and is expected to retain dominance over the forecast period as well. China is projected to be one of the largest consumers of propanol in the next eight years. Countries such as China, Japan, South Korea, and India in Asia Pacific are likely to be the fastest-growing markets for propanol during the forecast period. High demand for propanol in the chemical industry and as solvent in the paints and coatings industry are expected to be the key factors propelling the propanol market in Asia Pacific. The global shift of productions sites from developed countries to emerging nations is the key driving factor of the growth of these regions. Some of the leading players operating in the global propanol market are BASF SE, The Dow Chemical Company, Eastman Chemical Company, Mitsui Chemicals, Inc, ExxonMobil Corporation, Tokuyama Corporation, LyondellBasell Industries N.V., and Oxea GmbH. Propanol is a colorless alcohol typically available in two types of isomers: iso-propanol and n-propanol. Isopropanol was one of the first petrochemicals discovered in the ’1960s. It is used in various applications such as cosmetics, personal care products, deicers, resins, paints, pharmaceuticals, inks, and adhesives, as also as a chemical intermediate to manufacture various chemicals such as methyl isobutyl ketone (MIBK), isopropyl esters, isopropyl amines, acetone, glycerol, and isopropyl acetates. N-propanol is a used in the coatings industry as a medium-volatile alcohol for improving the drying characteristics of alkyd resins, electro deposition paints, and baking finishes. It is majorly used as a solvent in flexographic and other printing ink applications. Propanol is one of the key raw materials used in cosmetics industry. It has an ability to decrease the thickness of liquids and reduce the tendency of finished products to generate foam when shaken. Rising cosmetics industry is therefore expected to propel the propanol market during the forecast period, owing to its use in various cosmetics and personal care applications. Propanol are also primarily used to manufacture chemicals such as propyl halide, propyl amines, propyl acetate, and glycol ethers. Demand for propanol is projected to increase significantly in the next few years considering the extensive growth of the pharmaceutical industry in various regions. Asia Pacific dominates the propanol market in terms of production and demand. Countries such as China, India, Japan, and South Korea are expected to be the key consumers of propanol. Europe is the second largest consuming region. Propanol has also been used as a major raw material to manufacture acetone. However, rising production of acetone through cumene process is anticipated to remarkably affected the propanol market. This trend is anticipated to continue during the forecast period, and is therefore expected to unfavorably affect the market growth. This report analyzes and forecasts the market for propanol at the global and regional level. The market has been forecast based on volume (Kilo Tons) and revenue (US$ Mn) from 2017 to 2025, considering 2016 as the base year. The study includes drivers and restraints of the global propanol market. It also covers impact of these drivers and restraints on demand for propanol during the forecast period. The report also highlights opportunities in the propanol market at the global and regional level. The report includes detailed value chain analysis, which provides a comprehensive view of the global propanol market. Porter’s Five Forces model for the propanol market has also been included to help understand the competitive landscape in the market. The study encompasses market attractiveness analysis, wherein end-users are benchmarked based on their market size, growth rate, and general attractiveness. 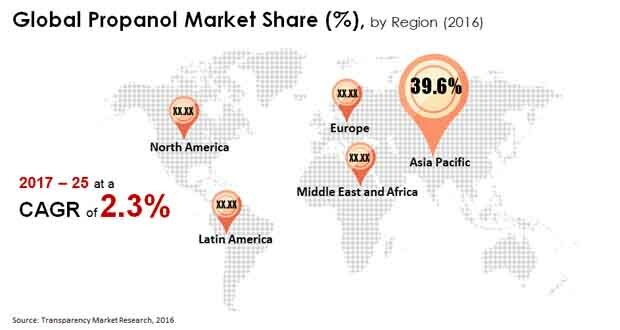 The study provides a decisive view of the global propanol market by segmenting it in terms of product type (iso-propanol and n-propanol) and applications such solvent, chemical intermediate, cosmetics & pharmaceuticals, others (Cleansers, adhesives, agricultural chemicals, etc.). These segments have been analyzed based on present and future trends. Regional segmentation includes current and forecast demand for propanol in North America, Europe, Asia Pacific, Latin America, and Middle East & Africa. The report provides the actual market size of propanol for 2016 and estimated market size for 2017 with forecast for the next eight years. The global market size of propanol has been provided in terms of volume and revenue. Market volume has been defined in kilo tons, while market revenue is in US$ Mn. Market numbers have been estimated based on product type and key applications of propanol. Market size and forecast for numerous end-users have been provided in terms of global, regional, and country level markets. Secondary research sources that are typically referred to include, but are not limited to company websites, annual reports, financial reports, broker reports, investor presentations, SEC filings, CSA Global, European Paints Association, World Petrochemical Organization, Indian Petrochemical Institute, FAO, internal and external proprietary databases, and relevant patent and regulatory databases such as ICIS, Hoover’s, oneSOURCE, national government documents, statistical databases, trade journals, market reports, news articles, press releases, and webcasts specific to companies operating in the market. The report comprises profiles of major companies operating in the global propanol market. The global propanol market is fragmented, however few global producers dominate the market. Key players include BASF SE, The Dow Chemical Company, Eastman Chemical Company, Mitsui Chemicals, Inc, ExxonMobil Corporation, Tokuyama Corporation, LyondellBasell Industries N.V., and Oxea GmbH amongst other manufacturers. Market players have been profiled in terms of attributes such as company overview, financial overview, business strategies, and recent developments.